Do I need a system communication Gateway and an Internet connection? Yes. Internet access should be provided for the Gateway to enable HiQ to supply firmware updates and to provide customer support functions. How many inverters can be used with one Gateway? The maximum number of inverters on each Gateway is 200, although local conditions might reduce that number. What methods are available to communicate with TrueString inverters? 1. Using the cloud API – this is the easiest programmatic method. Details are contained in the document here. 2. Using MODBUS TCP from an Ethernet connection to a system Gateway within the site firewall. Details are available here. 3. 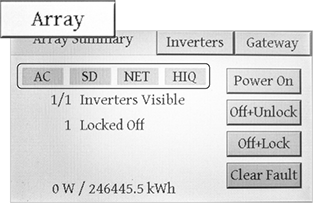 Using an optional Aux Port on an individual inverter. This needs to be special-ordered, and can’t be retrofitted. It uses RS485 to communicate using MODBUS RTU, and requires dedicated wiring. The first two methods are preferred. More details are available here. How much data traffic does the HiQ system transfer? 256 bytes per inverter per minute while generating (daylight hours). 256 bytes per inverter per 10 minutes while not generating (night time hours). Worst case is to assume longest summer day hours to calculate and give some extra padding to be sure you don’t hit any installation limits, such as might be imposed by cell modem plans for example. Firmware updates take about 1 megabyte of transfer. These are fairly rare. Remote diagnostics uses data at an unpredictable amount as it depends on what is being done at the time. These occurrences are rare also. Assuming a 30 day billing period, 4.608MB x 30 Days = 138.24MB per month in normal usage for 20 inverters. How do I troubleshoot Gateway connectivity issues? SD – The SD card is inserted and the file system is OK.
NET – The network is connected. This doesn’t necessarily mean that it’s able to communicate, but the cable is OK and the Gateway has acquired an IP address. The PLC signal strength is low - what do I do? Occasionally PV installs using TrueString inverters experience issues with the Power Line Communication (PLC) used to communicate between the inverters and the HiQ communication gateway. One reason for this can be that the nearby grid is sufficiently low impedance that the PLC signal ‘leaks away’ and has insufficient strength remaining for proper communication to occur. In this instance the PLC Cores provide a means of increasing grid impedance in the frequency band used by the HiQ system to ensure sufficient signal remains. External noise can be another source of issues. HiQ Solar offers third party PLC Core common mode chokes as an ordering convenience. More information can be found in the PLC Core Guide. Where did my 'Discover' button go? A recent Gateway firmware update made improvements to the discovery functionality. The ‘Discover’ button has been promoted to having a screen all to itself – from the ‘Inverters’ page, press ‘Setup’. 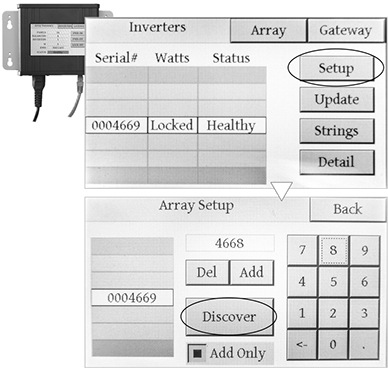 This brings up a page dedicated to the discovery, addition and deletion of inverter serial numbers from a site locally. Also included is a default discovery search that does not delete previous entries, only adds new units it finds to the existing site list. For a clean-sheet search the ‘Add Only’ check-box can be unchecked.